A missionary priest from France, Fr. Levy was assigned by the Diocese of Galveston — essentially the entire eastern half of the state of Texas after 1874 — to minister to the faithful and bring the Word of God to all people, many in dire need of hearing it. Most Texans who knew Fr. Levy saw him as a priest full of compassion and understanding. They could count on him as a person who kept his promises. Others, like a band of nefarious outlaws in southeast Texas, learned the hard way that this man on a mission allowed no one to stand between Christ and His people. A dramatic case in point was relayed by Father E.A. Kelly, pastor of St. Anthony Parish in Beaumont, who described Fr. Levy’s encounter with the desperados for the Jan. 6, 1924 Beaumont Enterprise. While the missionary priest was riding his circuit there around 1875, he unknowingly crossed into the outlaws’ hideout. The bad men yanked the priest from his mount, which they promptly added to their own string of horses. They mocked the priest and led him to a hanging tree, forcing him to take a close look at several notches in the trunk, representing each of their other victims who had crossed their path. They told Fr. Levy to hit the road on foot and never to return, lest he die by the same fate. It is exactly here, at this dusty, desolate Texas crossroads, where we find a determined priest with a hard decision to make. Does he abandon his normal route, delaying or in some cases denying the sacraments for local Catholics? Does he let evil stand in his way? Deprived of his horse, Fr. Levy set out on foot, leaving the ne’er-do-wells more amused than angry at the priest’s bold comments. Their amusement turned to bewilderment a few days later when the outlaws saw Fr. Levy riding purposefully back into their camp. He had returned for his horse and to make true on his earlier promise. “I can knock the eye out of a fly with this rifle,” Fr. Levy said, as he slid a long gun from the leather scabbard attached to his saddle. He then proceeded to prove it, putting on a shooting display that quite humbled his astonished audience. They had not realized that the man of the cloth before them had been a sharpshooter in the French Army before joining the priesthood and coming to Texas. After the dust settled from the shooting exhibition, the outlaws did as the priest had earlier instructed them and lined up to recite the Lord’s Prayer. It was a most unconventional but highly effective catechesis for the ruffians, who not only prayed, but also promptly returned the priest’s horse to him. This was the man who came to North Texas in the 1870s to ride a circuit from Gainesville to Amarillo and the borders of the territory of New Mexico and Indian Territory, present-day Oklahoma. The meandrous route branched off in a multitude of directions. Altogether, including the return, it was nothing short of a 1,000-mile faith journey, taking months to complete. 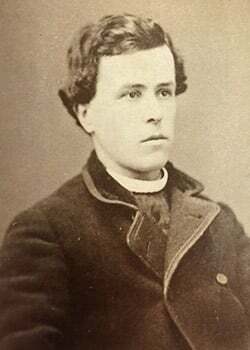 In 1879, Fr. Levy helped a growing group of Catholics in the Clay County community of Cambridge build a small wooden church. The arrival of a railroad line could make a town in those days and the lack of one could break it. The latter was the case for Cambridge in 1882 when the Fort Worth and Denver Railway bypassed the town in favor of nearby Henrietta. The population soon left the once-thriving Cambridge in favor of the new railroad stop and county seat of Henrietta. That same year, under Fr. Levy’s direction, parishioners fashioned a rolling platform under the church, hooked it up to 18 pair of oxen and hauled it about three miles from Cambridge to Henrietta. During the span of building the church in Cambridge and later carting the oversized load to Henrietta, Fr. Levy was multitasking, building a house of God for Catholics in Gainesville, about 65 miles east. Fr. Levy helped parishioners construct the first St. Mary Church in Gainesville in 1881. It was a two-room cabin. One room was used for worship services and the other served as the priest’s living quarters. The modest, but welcome, rectory in Gainesville afforded the circuit-riding priest the opportunity to launch off from a strategic location on his travels through North Texas and points northwest. By 1884, Fr. Levy was frequently serving several Catholic families in Wichita Falls, celebrating Mass in the homes of the faithful. His work would later give rise to a Catholic community that would one day become Sacred Heart Parish. Around 1886, the industrious priest was supervising construction of a church for Catholics in Montague. Also around that time, Fr. Levy was helping firm up a strong Catholic community in Nocona. Among the many towns he served from 1879 to 1886 were Cambridge, Gainesville, Henrietta, Decatur, Wichita Falls, St. Jo, Nocona, Belcherville, and Montague — all inside the boundaries of the present-day Diocese of Fort Worth. At a time that seemed to be at the apex of his ministry in North Texas — building churches from the ground up, moving them to population centers when needed, raising funding for construction projects, making plans for future worship facilities, and riding a 1,000-mile circuit — Fr. Levy died tragically on December 17, 1886. His death came in service to the Lord. According to church records at St. Mary Parish in Gainesville, Fr. Levy was traveling in his horse-drawn rig along the new railroad line near the town. He likely had been visiting with hard-working Catholic immigrants laboring to extend the Atchison, Topeka, and Santa Fe Railway from Fort Worth to Gainesville that year. The major project linked North Texas to one of the longest rail systems in the country. As equines are sometimes prone to do, especially around unfamiliar sights, one of Fr. Levy’s horses spooked and darted wildly, sending the priest’s cart out of control. Fr. Levy reportedly died of a fractured skull. News of the calamitous accident shocked the faithful who knew and depended on him. Inspired by the way their priest had served the Lord, many Catholic communities throughout North Texas carried on with much of Fr. Levy’s unfinished work, funding and building new churches and schools he had planned. This pioneering priest now lies in eternal rest inside the Diocese of Fort Worth, within the walls of St. Mary Church in Gainesville. A simple marker outside the church, along the base of the wall, marks the spot of his interment. 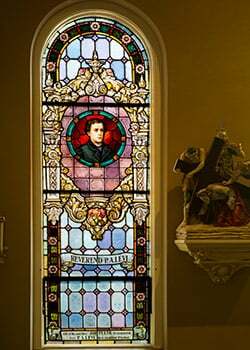 A stained glass window in the church commemorates the life of the selfless French missionary priest who served Catholics in the Lone Star State. This resolute, 19th century disciple of Christ did not let any person or any thing stand in the way of bringing Christ to the people of North Texas. Although Fr. Levy’s life remains relatively unknown, his shining legacy reflects brilliantly in rural churches in the area. Fr. Peter Anthony Levy’s tireless work would be a critical first step in the eventual creation of one of the nation’s largest and fastest-growing Catholic ecclesiastical districts — the Diocese of Fort Worth.